Sunday, November 11, 2018, commemorates 100 years since the armistice that ended World War I. World War I spanned a little over four years and claimed the lives of over 16 million people, including nearly 7 million civilian lives and 10 million military lives. The armistice on November 11, 1918, ended fighting on land, sea, and air between the Allied forces and Germany. 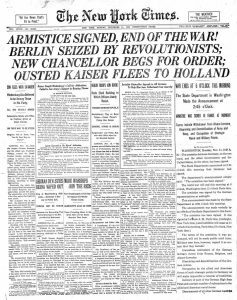 In the week proceeding November 11, 1918, several smaller armistices were signed between factions of warring nations, but it wasn’t until the armistice was signed at 11 AM on November 11, 1918, that the ceasefire became official. The armistice was signed in a secret location—Ferdinand Foch’s private train car, which was parked in a forest in Northern France. Foch was the Commander-in-Chief of the Allied Forces. However, this was not the official end of the war. The formal state of war ended with the signing of the Treaty of Versailles on June 28, 1919. The United States’ involvement in World War I did not formally end until the Knox-Porter Resolution was signed on July 2, 1921. Ferdinand Foch is recorded to have said, following the signing of the Treaty of Versailles, “This is not a peace. It is an armistice for twenty years.” World War II began 20 years and 65 days later. November 11 has become celebrated in many countries of the world as the anniversary of the end of World War I and is also commemorated in many places as Armistice Day, Veterans Day, and Remembrance Day. An exhibition of World War I propaganda posters is currently on display at the BYU MOA. Stop in to visit For Home and Country: Posters and Propaganda from the Great War.